Online Courses - Communicating- Today's Way, Inc.
"Do On Your Own Time"
How To Create An Editorial Calendar "FOR YOU!" Maximize the effectiveness of your communications for tatgeting the thought. Achieve great online coverage by utilizing all appropriate resources into the mix. Give an assigned purpose to each communication. Simplify your life and save you TIME! 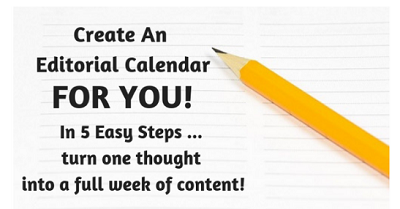 30 minute 1-on-1 phone consultation about your calendar with margie hanson.